When your heart is full of love. Of longing. Of loss. 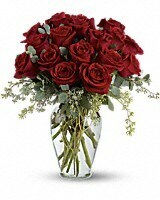 You can pay tribute with this incredible arrangement of roses and eucalyptus in a beautiful ming vase. Cherish the moments you had and the memories you will hold onto forever.